So I made a second batch of shortbread cookies and changed a few things around to see if I could make the cookies light and flaky as my grandmother used to do. I shortened the baking time by almost half, hoping that would keep them from being as hard as the first batch. Unfortunately, although I changed the baking time, I ended up having to slightly microwave my butter as it was too hard to work with and the middle liquified, which I didn’t realize until I added it to the dough. I’m thinking that may have de-flaked my cookies as it seems to me that cutting in the butter is quite important for that layered light and flaky pastry texture. I also had a friend of mine suggest using a different flour rather than all-purpose, which is what I have been using. He suggested bread flour and I am now wondering if pastry flour would make a difference? Any thoughts from my more experienced readers? 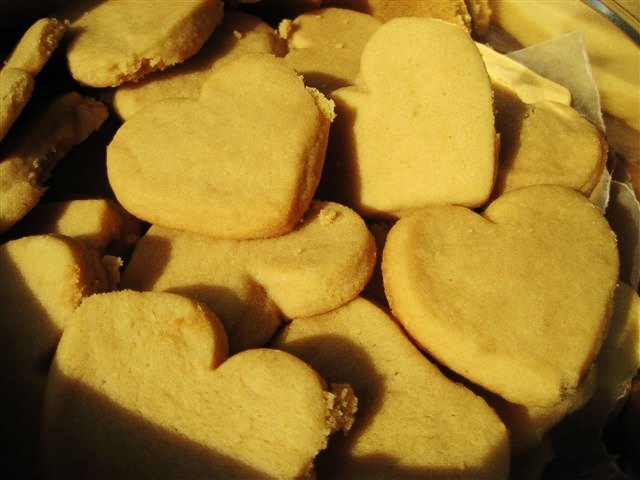 This entry was posted on Sunday, December 19th, 2010 at 1:14 pm	and tagged with butter, cookies, cooking, Edible Failure, food, grandmother, recipe, shortbread and posted in Baking, Cookies, Desserts, Edible Failure, Reader Query. You can follow any responses to this entry through the RSS 2.0 feed. I would try cake and pastry flour ,leave your butter out overnight to soften it without it melting and treat the dough gently don’t over knead it .It should just be turning golden at the edges when it is done. Goodluck newbie baker !